Try to imagine living your life without cash. The work you put forth helping other people is paid for in goods or services you need. If you have an extra microwave oven and need a blender, you simply swap items with a member of your community, and neither item goes to waste. This is part of what a Grand Rapids-based organization, Mutual Aid GR is trying to achieve. In addition to their “Barter Board,” Mutual Aid also assists in planting community gardens and focuses on direct action to help citizens of Grand Rapids who are in need. Using nonviolent actions to draw attention to existing problems and highlight solutions is the sort of social justice work that led Nicole Berens-Capizzi to become a core member of Mutual Aid. “I've always felt a connection to the outdoors, and as I grew older and learned more about the environment, wildlife, social issues and how these issues are tied together, and the more urgent the situation becomes, the more I believe I have a moral obligation to get involved,” she says. When Berens-Capizzi heard about Mutual Aid while attending an Occupy demonstration, she readily became a member. Her belief in the power of direct action to bring about change is also a fundamental belief of Mutual Aid. “There are a variety of methods to help,” Berens-Capizzi says about the many different ways community aid organizations offer services, “and they all take very committed individuals.” She says that although amassing a crowd to hold signs in demonstration is effective at gaining media attention, it is pointless if demands are not made and, consequently, met. Berens-Capizzi’s day job, you could say, utilizes her background in psychology and sociology while working in a crisis home near Holland. The home serves as a temporary respite for people who are undergoing some extreme circumstances. Usually a visitor to the crisis home stays less than a week, and the workers there assist visitors with housing, medication, and putting the person in contact with organizations that can help. A native of the Dorr area, Berens-Capizzi grew up as part of a farming family and has many roots in West Michigan, which leads to her passion for protecting her home. An article written by Sandra Steingraber and published in Orion Magazine drew Berens-Capizzi’s interest and sparked a bit of a fire within her. 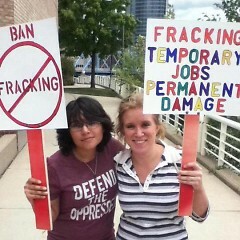 It revealed an energy industry she had never heard of: hydraulic fracturing (“fracking”). 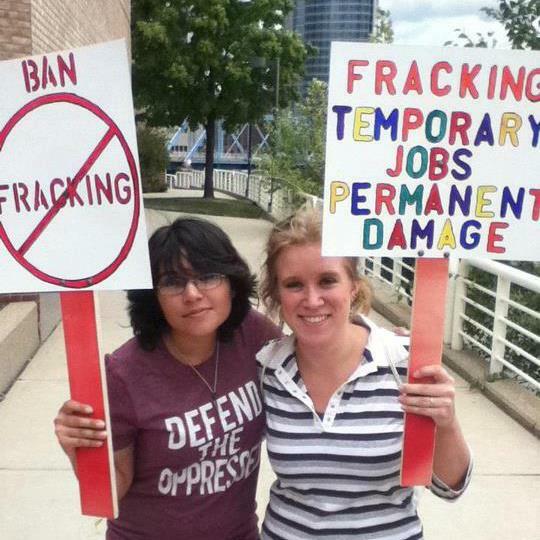 Gradually, as Berens-Capizzi learned more about fracking, she began to think about her home and her life here in West Michigan, and if she would be comfortable with fracking in her own backyard. “I live on this beautiful planet, and I consume its resources. Simply trying to reduce my impact isn't enough. I need to do more to actively fight the destruction of our water, the ecosystem, and communities – both human and nonhuman,” she says. After attending a mineral rights auction – where the Department of Natural Resources leases drilling rights of public lands – she realized that this was an issue where citizens needed to fight to protect Michigan’s natural resources. Berens-Capizzi sees things a little differently. “Although the Michigan Department of Environmental Quality claims that they do not necessarily support Hydraulic Fracturing, they hold public meetings with oil and gas industry representatives in attendance with sample mineral rights leases for landowners in the area to learn how to sign. Typically low-income, rural regions are targeted since landowners in those places may be more inclined to accept money from oil and gas companies,” she says. A particular area of intrigue for Berens-Capizzi is the aspect of confidentiality agreements that landowners are obligated to sign as part of the lease contract. “Although they vary regionally, and even between companies, these agreements usually prevent a person from speaking about the drilling on their property to the media or even their own neighbors,” she says. Doctors, too, must sign similar non-disclosure agreements if they wish to view a list of the gallons and gallons of proprietary chemical mixtures these oil and gas companies pump into the ground. “It’s terrible,” she says. “Luckily, animals and livestock are usually not included in these agreements.” Citing the Bamberger-Oswald study “Impacts of Gas Drilling on Human and Animal Health” (2008) Berens-Capizzi was visibly emotional as she talked about farmers near fracking wells who participated in the study after their livestock started having stillbirths, major birth defects, and even missing hair on newborns. It’s not too hard to imagine a similar tragedy happening to her own community, even her family, if gas drilling in Western Michigan goes unchecked. That same study also referenced how people – not just animals – near gas wells began having illnesses attributed to having arsenic in their blood, and since then oil and gas companies are required to provide an alternative water source to people with these symptoms, in case the water from their well has been contaminated. Berens-Capizzi sees this as a tragedy. “Not only is bottled water wasteful, but people should not have to stop drinking out of their own wells if a corporation contaminates the water supply,” she says. Berens-Capizzi is also passionate about water, as are most residents (and even tourists) of Michigan. Although the Great Lakes Compact limits consumption of water in the Great Lakes – St. Lawrence Basin, there are exceptions provided for water when the amount is “considered reasonable for the purposes for which is is proposed.” Water used for fracking is exempt from this and can consume five to seven millions of gallons of water, per well. After being mixed with sand and toxic chemicals, this “flowback water” can never return to the standard water cycle and is disposed of in underground injection wells. Berens-Capizzi strongly believes that getting involved is very person-specific. Some people are more suited to drafting legislation or organizing signature collections for petitions, while others- like Nicole Berens-Capizzi- are more comfortable with face-to-face interaction, finding ways people can better themselves and their community through direct action.